Just like for New Year’s Eve, it’s never too early to start planning out your Halloween decorations. As time passes, Halloween is becoming an increasingly popular holiday. Long gone are the times when it was just kids going through the neighborhood asking for candy; nowadays, if you don’t have a costume and at least one mean-looking pumpkin, why are you even celebrating? It’s no wonder that Halloween gained such popularity – it’s the time of the year when you get to enjoy autumn at its prettiest, let loose and eat a bucket full of candies if you want to without anyone judging you (not even your fitness trainer), but also, it’s a time to bring unapologetic cheerfulness into your home. The beauty and power of good lighting haven’t escaped you, we’re sure. So keep on reading to get some neat ideas and tips on how to light up Halloween decorations to make them look more surreal and spookier than ever! Take your time to set the right atmosphere. The mysteriousness should start outside – bathe your house in green and fiery orange lights and greet your visitors properly. The adults will be amused, and the children will absolutely love it! If you think this is hard work, think again. All you have to do is place colored floodlights on the ground (or on the trees, it’s your choice), point them at your home and voila! Perfect lighted outdoor Halloween decorations are done. Alternatively, if you want to put in a little more effort, use a ladder to draw Halloween decorations by using string lights on your façade and windows! This will make an outline of your house and make it appear as a real-life drawing come nightfall. 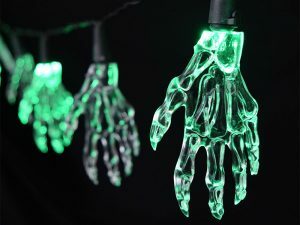 Well, there are quite a few ways to make lighted Halloween window decorations. We’ve picked some of the best for you to choose from. Backlighting – Get a black poster board and make a silhouette out of it. It could be a witch on a broomstick, a ghost, or a man with a knife. Depending on your time and skills, almost anything goes. Once you’re done making the silhouette, just tape it to your window, and position a light behind it, so that it’s pointing towards the window. It’s as simple as that. Projecting – Speaking of backlighting, there is a way to take it up a notch and make it, way, way scarier. Wake up an inner geek and dive into Halloween projector decorations! First, you’ll need a projector (if you don’t have one, this is the perfect time to buy it). Secondly, you need to have a scary looped footage at hand. If you don’t have it – fret not, you can find anything on the internet, including companies that sell DVD with looped footages of ghosts, demons, witches, skeletons and so forth. The times we live in, huh? And lastly, you’ll need a semi-opaque white window cover, so that the material catches the projection, while also making it look transparent. This is our favorite Halloween decoration for sure – it’s the most realistic, and can really make everyone terrified (yes, even the brave ones that dare to watch horror movies alone)! If this is too much and you wish for something way tamer, then playing around with Christmas lights and backlighting could be the right choice for you. Think of some words that you associate with this holiday and write them in string lights on your windows. Will this be scary? No. Will it be cute? You betcha! Yes, we know – while you do want to bring out the holiday spirit, you don’t actually want to live in a haunted house and redecorate so as to make them uncomfortable for you to be in them. Luckily, there’s a solution to this. You can both decorate your house and enjoy the comfort of your own home. Plus, if you make this a play time with the kids, you’ll double the fun! You know all those jars you have laying around, that you saved for reasons only known to you? Well, Halloween is the perfect time to use them and make them into decorations. You’ll need a black sharpie marker, some lights (candle lights are most commonly used, but you can play with string lights as well) and a steady hand. Make a bunch of these and place them all around your home. Your kids will be proud of this DIY project! Halloween String Lights – If you prefer to make your home fun instead of spooky, try hanging some Halloween string lights. They come in all shapes and sizes, they don’t require any niftiness on your side, you just have to pick the ones you like the most and get to decorating. Ghosts, broomsticks, pumpkins, cats, and skulls – the right light bulb shape is really hard to choose! 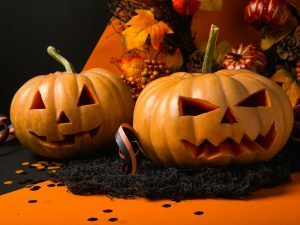 Whether you decide to go all-in and invest your time and a little bit of money into really making your house the main Halloween fortress in the neighborhood, or you opt for a calmer lighted jar variant, there’s one thing that you absolutely must have in abundance in your house during Halloween. You guessed it, we’re talking about candies. The more colors and flavors, the more fun trick-or-treaters will have. After all, isn’t that the whole point of Halloween?